On this Krishna Janmashtami, Dwapara Era’s Yog again! Krishna Janmashtami will be celebrated today on September 2. Read here to know Puja rituals, muhurat and significance of this auspicious festival. 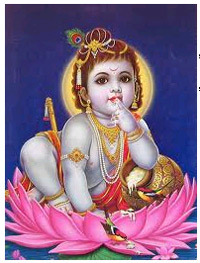 He is the most mischievous (Nand Gopal), naughty (Nand Lal) child of Yashoda, and the God of all devotees. He is Shri Krishna. Birth anniversary of the Lord will be celebrated with lots of zeal, enthusiasm and happiness. Though, the festivities of this day will be just like every year, but this time there is something special about this day. The special Yoga which is forming on this day is exactly the same as was during the birth of Lord Krishna in Dwapara Era. This Yoga is also known by the name of Shri Krishna Jayanti. When it is Rohini Nakshatra at midnight 12 AM, Sun planet is in Leo Zodiac Sign and planet Moon is in Taurus Sign during Ashtami of Krishna Paksha in Bhadrapada month. The combination of these celestial phenomenon create Shri Krishna Jayanti Yoga. This is the same Yoga which was formed during the birth of Shri Krishna in Dwapar Era. This time, the same Yoga is appearing on September 2, 2018. Today, Ashtami Tithi will start after 08:49 PM, and Rohini Nakshatra will also exist in this period. To make your love strong and happy, offer cow’s milk (as Bhoga) to Lord Krishna and perform Abhishek with Panchamrit. To get worldly comforts and happiness, offer sugar and butter (Makhan-Mishri) to the God and perform Abhishek with raw Lassi. To get rid of physical disorders and diseases, offer milk mixed with Tulsi to Shri Krishna and perform Abhishek with raw Lassi. To remove all obstacles in your work, offer sweets (Ladoo) to the God as Bhoga and perform Abhishek with Sugarcane juice. This year, special Yoga of Shri Krishna Jayanti is especially auspicious for the people who are still childless. On this propitious Janmashtami, they should fast (Vrat) and follow the right rituals (Puja Vidhi) to worship the God. They must also chant Santan Gopal Mantra and if possible, should establish Santan Gopal Yantra in their homes. As per ancient scriptures, Janmashtami Puja and Vrat has great significance in Hinduism. According to religious beliefs, Shri Krishna was the eighth reincarnation (Avatar) of Lord Vishnu. It was believed that the mere sight of the Lord eliminates all pain and sufferings of the people. In Vedic texts, the fast of Krishna Janmashtami is among the most significant fasts of Hindu religion. The devotees who perform the propitious fast with true reverence achieve great virtue and blessings of the God. Additionally, the fast of Krishna Janmashtami offers people with child, family growth and freedom from Pitru Dosha. AstroSage wishes our readers a happy and blissful Shri Krishna Janmashtami! This year Krishna Janmashtami, the birthday of Lord Krishna is on the 28th of August 2013. This is a festival celebrated far and wide by everyone. One can say that he is one of the most loved, adored and earnestly worshipped God among Hindus. Lord Krishna's influence has reached beyond India, many westerners are also showing interest in knowing and following the Krishna path. Lord Krishna's life can be summarized mainly into 3 parts; his birth and childhood days, his youth and his role in Mahabharata. Lord Krishna is the 8th incarnation of Lord Vishnu, who is the most powerful and also most popular avatar of Lord Vishnu. Krishna was the son of Vasudeva and Devaki, who was born as a reliever of the evil that had engulfed Mother earth. Soon after his birth, Lord Krishna was taken to a small village called Gokul where he was brought up as the son of Yashoda. Later on, Lord Krishna slew all the demons who posed a threat to the people of earth. Some of the famous stories include, Killing of King Kamsa, his uncle and the ruler of Mathura; Killing of demon Putna , when he was only a baby, by sucking on her breast; Killing of Kali Nag who had poisoned River Yamuna and thus making it poison free. Now, lets see the fun part of his childhood days. Lord Krishna was famous for being a mischievous child. His love for butter and Indian sweets, especially Ladoos is known by everyone. Legend has it that, there has not been a day in Gokul when Krishna hasn't tried to steal butter and ladoos with the help of his trusted and equally mischievous brother Balaram and friends, much to Yashodha's worry to answer to the cries of all the neighbors' whose pots have been emptied of butter. His childhood days were spent as a cowherd, playing his mesmerising music with his flute and playing pranks on the Gopis and the people of Gokul. Krishna who was famous for his charisma, valour and strength was loved and admired by one and all. He married Rukmini, the princess of Vidarbha and daughter of Bheemshaka. But a more popular and sought after story would be the story of Radha and Krishna. Even though Krishna ended up having wives, the love of Radha and the Gopika's for Krishna is regarded as the most purest. There are many stories to back this above sentence. Once Narada asked Krishna why he considered Radha's love more pure than his wife Rukmani's. To this Krishna answered , the love of Rukmini is as a wife, who loves and worships her husband, who expects the same love and which can be paid back by loving her. But Radha's love is selfless, that she does not expect anything back from Krishna but to have the chance to Love him for eternity. The love between Radha and Krishna is considered the most purest and many worship them and seek their blessings. This stage in history can be considered the most important of all. The entire encounter is made into a book called Mahabharata, which is the most read, sought after book in the history. Krishna moved to Hastinapur to live with the Pandavas and Kauravas. When the Pandavas and Kauravas fought for the Kingdom, Krishna was sent as a mediator and failed in bringing peace between the two parties. Eventually a war broke out between the two which lasted for 18 days. Krishna played his part as the Chariot rider to Arjuna. It is then, that Lord Krishna advocates Arjuna about the Nishkam Karma Yoga (selfless action) which is the sacred path to achieve the truth. This part alone, where Krishna advises Arjuna makes the heart of the holy book Bhagavad Gita. The battle of Kurukshetra between Pandavas and Kauravas was fought in about 3000 BC.